I am Mr. Frugal in the kitchen. I got my frugality from my mom who taught me, at a very young age, never to leave even the tiniest morsel of food on my plate unconsumed. My family wasn’t well-off and my parents pinched pennies while they raised me and my five sisters. I think frugality is an admirable trait as long as it doesn’t get ridiculously over the top. I try not to be wasteful and use everything in our fridge and pantry before they spoil like the very last rib of celery or carrot for stir-fries and shrimp heads and shells for stock. I try to always rinse the can of tomato sauce with a little water before tossing it to get the very last ounce of sauce for menudo or afritada. The other day, I learned a neat trick for using leftover green onion bulbs — the white parts with the roots still attached. These can be used to regrow the green leafy parts that are great for garnishing noodles and soups. 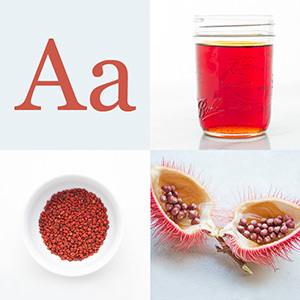 Take a small glass jar, like an eight-ounce canning jar, and prop the stems inside. 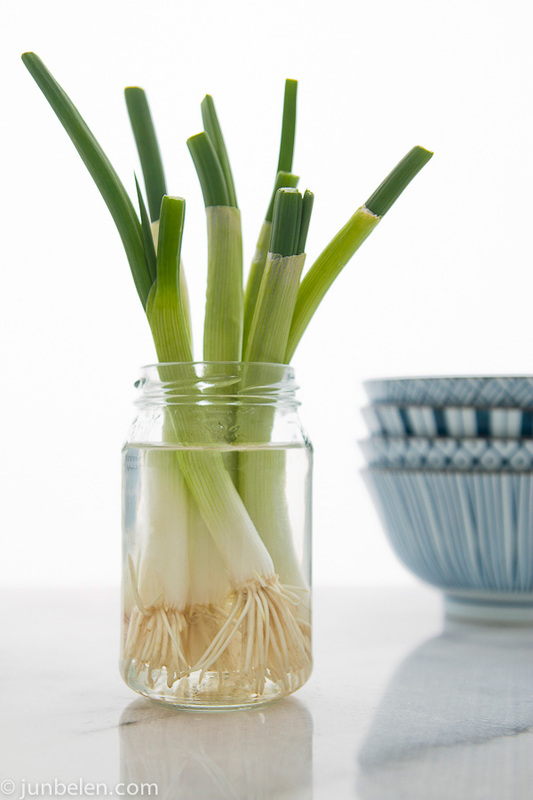 Fill the jar with water until the roots are completely covered and place the green onions somewhere where there’s plenty of sun. We let ours sit on our sun-soaked kitchen windowsill next to the bud vases we use to root cuttings of thyme and other herbs. The bulbs can also be replanted in dirt in containers. In no time, the aromatic green leaves will start to grow back and you can snip them away as you need them. Replace the water in the jar with a fresh supply every few days. Green onions cut into fine slivers are an absolute must for dishes like arroz caldo, pancit molo, and pancit palabok. Thanks to Homemade Serenity for this great tip. Please, pass it on. Neat idea! Thanks for sharing, Jun. I’ll do this right now! Oh! Love that you wrote on this. I did this growing up as a little trick learned from my mom, and it was like second nature. That is…until I moved to the Bay Area and a co-op that asked me to stop because they didn’t like the smell (of the onion water) and told me it wasn’t saving enough money to be worth it. I guess we weren’t on the same page of frugality…why not tease a second or third life from something edible? Keep growing. Yes, MJ. About an inch from the bottom where the roots are. They grow very quickly. Thank you Jun. This is a great idea. I love all the reminiscing everytime I see a new recipe pop up on my email. Thank you, Day, for the note and for following the blog! That is so cool. Thanks! Great tip. I love green onions. I should seriously consider doing this at home. Lovely photo too. Fantastic idea! Hey, Jun–I didn’t realize you were so waste-conscious. You might like to join the Four Pounds of Cheese group on fb where we post articles/tips/recipes/ideas for using up every last bit of goodness. If you get a sec, check it 0ut. Now, off to regrow my green onions! I LOVE this tip. I saw it on pinterest recently, and still haven’t gotten around to try it for myself… but I plan on it the next time I buy a bunch Thanks for the nice writeup.